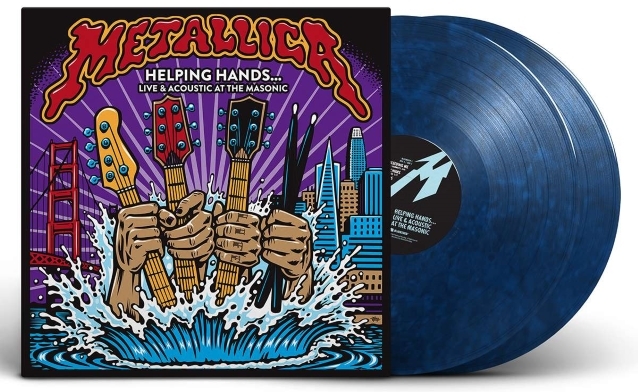 METALLICA will release a limited-edition vinyl of "Helping Hands… Live & Acoustic At The Masonic" next month. The double album, mixed by Greg Fidelman and newly mastered for vinyl by Reuben Cohen at Bernie Grundman Mastering, documents the inaugural "Helping Hands" benefit concert held in San Francisco on November 3, 2018. "Helping Hands… Live & Acoustic At The Masonic" features rare acoustic renditions of hits and deep cuts spanning the METALLICA catalog (as well as covers of DEEP PURPLE, NAZARETH, BOB SEGER and BLUE ÖYSTER CULT classics), captured on 140-gram colored vinyl with proceeds donated to the band's All Within My Hands Foundation. "Helping Hands… Live & Acoustic At The Masonic" continues AWMH's mission to fight hunger and to assist in creating sustainable communities through workforce education. 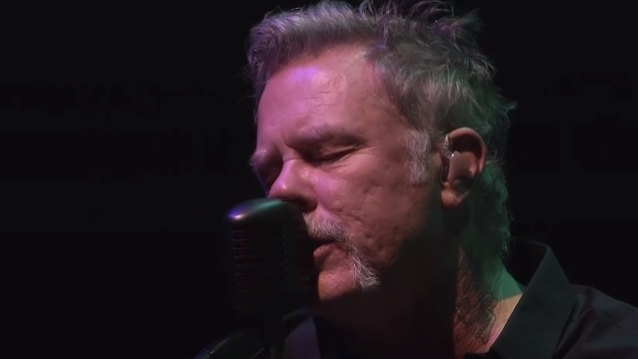 Professionally filmed video footage of METALLICA performing the song "The Four Horsemen" at "All Within My Hands Foundation Helping Hands Concert And Auction" can be seen below. The album will be available February 1 at independent and digital retail around the world, all streaming services that feature METALLICA's music, and can be pre-ordered in the METALLICA store. All copies will include a download card. In addition to the vinyl pre-order, METALLICA's offerings will include a limited-edition etched glass featuring the iconic Pushead artwork for "One", with all net proceeds donated to AWMH. The first-ever "All Within My Hands Helping Hands Concert And Auction" raised more than $1.3 million. Those resources will fund AWMH's efforts with partners at Feeding America and the American Association of Community Colleges. The METALLICA family and the All Within My Hands Foundation board members are committed to running an organization of the highest integrity where expenses are kept to a minimum and are paid for entirely by the band, the board, and friends who have worked with the band over many years. As such, 100% of all donations from fans and third parties go to the organizations AWMH supports. For more info and/or to make a donation, visit allwithinmyhands.org.